On Sunday, May 22 I washed my son's last Little League uniform for the last time. As the stinky socks were turned right side in and the sweaty hat was thrown in for its final disinfecting, I felt a chapter in my life close. His team, the Nationals, finished the regular season in first place with an impressive 15-5 record, this despite losing their All-star catcher mid-season to a retinal detachment, a blow from which no one ever expected the team would recover. However, they played substandard ball in the tournament coupled with some additional "staffing handicaps", and before its midpoint, the Nationals were eliminated. I didn't always love it. When Nicky was 6 and played Tball, I sat on my folding chair rolling my eyes in response to the sheer drudgery of it all. Every little MuckDog, that was actually the team name, the Muckdogs, came up to bat in every inning and I swear there were like 18 of them. Each painfully swung and many missed, even when the ball sat on a Tee. A ball fielded, thrown to first, and actually caught was a signal of a possible future scholarship opportunity. But this was our foundation. 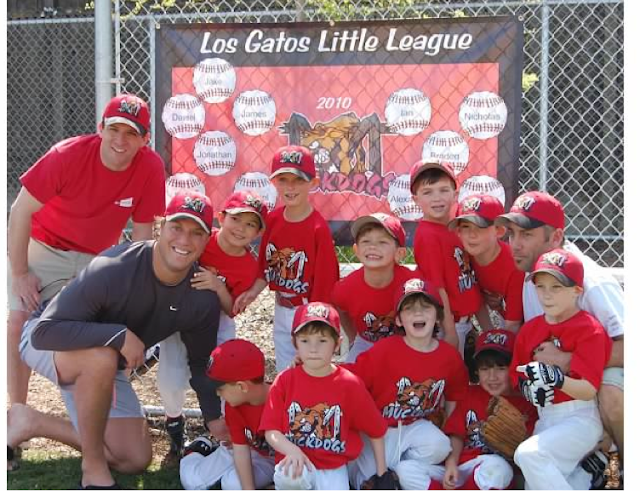 Three of the boys on this team are still among Nicholas' best friends. We are still close to all three of the coaches seven seasons later. We can still name most of the players on the team and half are still playing majors level ball in Los Gatos. 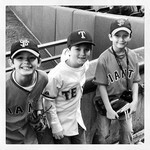 These were they days when boys learned to love baseball. At least in single A, when there were three outs the inning was over....I think. It really wasn't until AA in second grade that the game we were playing on the little dirt diamond started to resemble baseball. Double A is also the last level wear you can pretty much get whomever you want on your team, despite the fact there is some form of a draft, so 'Chief' and his minions managed to pull almost the whole team together again. In AA there are three outs, but achieving three outs can take an eternity. This is the first player pitch level and though the strike zone, now determined by a real 11 year old umpire, is roughly the size of a twin mattress, there are LOTS of walks and LOTS of strike outs, as kids either swing at everything or swing at nothing. Double A was the first year I remember having fun. The AA stands were small and usually dirty, so the warm spring months lured us and our blankets and lawn chairs to the outfield, where we frequently sipped on Chardonnay and margaritas and munched on chips while waiting for our boys to make contact. It was also this year that there seemed to be something to cheer for. Wins and losses were actually tracked and there was actually a recordable score at the end of the game. I learned to cheer and I learned to cheer loudly. I also remember this year being the first in which I worried that they might not win. The transition to AAA was a hard one. 'Chief''s son was a year younger and was staying in AA, as was 'Chief.' Added to this was the fact that most of Nicky's best friends were staying in AA another year, either because they weren't ready to move on or because they were younger. By Little League age and by ability, however, Nicks really needed to move up, so we threw ourselves into the AAA draft. We did not show up for tryouts because we thought one of Chief's co coaches was going to coach and was going to draft Nicky. He did not coach and he did not draft Nicky. In AAA there is no sitting in the outfield, as the boys really do hit that far. For the first time there is a measured outfield wall, which balls occasionally go over, clearing the bases. There are real stands with a home and an away side, though the mixing of the two is quite frequent. There is a real scoreboard, usually controlled poorly by younger siblings, which informs everyone where the game stands. Players can steal bases. Our first year in Triple A was tough. Nicky was the youngest player on the team. The boys that were two years older were poor examples of good sportsmanship. Nicholas only batted like .275 that year and sat on the bench a lot. The team couldn't bat at all from like the 6 spot on (and in AAA the whole team of 12 bats) and finished with a losing record. The second year of AAA was worlds better. We won a lot and Nicky started to catch and pitch and play shortstop. Triple AAA was about the level I started to really care about what happened in the games, especially in the second year. In AAA was when I started to pace the Los Gatos Creek Trail instead of watching my son close out the last inning of a tight game. In AAA was the first time I remember not being able to drink coffee before a morning game, and being relieved if someone brought adult beverages to an afternoon match up to 'take the edge off.' The stress would sometimes start as early as noon and I remember once having to have a glass of wine at lunch (the game was probably at 5!) to calm myself down. I cheered so loudly I nearly passed out a few times. I'm not sure why--but I think I care more than the average parent--and probably more than I should. I should likely be glad that I do not have something more serious to care about than how my son's little league team does. When I used to come to Little League Opening Day and see the big boys playing on the Majors field at Blossom Hill Park, I thought those days were so far away, but suddenly my son was 11 and we were there. Nicky was drafted by a rock star manager and we had a great team and were off and running. Majors is a little bit of a separation from the men and the boys. At the majors level, boys are pretty serious about baseball, and most players receive private coaching, play fall travel ball, or both. In majors, though you still have 12 boys on the team, only 9 bat. Batters can be removed from the line up and can be 'subbed' with other batters. Players at the majors level are only guaranteed three innings in the field and ONE at bat. If you're not a strong player, you don't play much, and this can be frustrating. A lot of boys quit after AAA, and many others stay an extra year in AAA and play only their final little league season in majors. Nicholas has said that his first year in the majors was his best year in Little League. The 12 year olds were leaders and were good to the younger players and the 11 year olds were talented and met the challenges of playing at a new level well. In fact, four out the five 11 year olds made the all star team that year. The team wasn't just lucky, they were good. They enjoyed playing together. They lost, but no tears here! This year was our last and it was different, but not necessarily in a bad way. In general, the majors teams were younger and less talented. Nicky did a lot of pitching and a lot of playing shortstop. He was forced to grow up and lead the team. He lamented the loss of his catcher, with whom he was so in tune, but tried to learn to make the best of situations beyond his control. It was a good fun successful season and a good way to walk off the playing field. 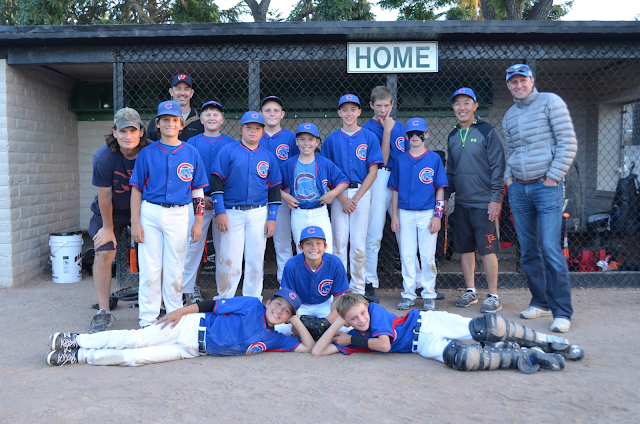 It's not like our baseball days are over--at all--but a life experience has come to an end. Thanks LGLL. You have been good to us. Thanks for the friends made, the walk off wins, the double plays, the balls caught by the little guy in right field, the homeruns that bounced on the wall and landed on the other side, the squibby singles that died in the long grass, and the line drives to the shortstop to end the game. Thanks for the hours and hours and hours we spent at the field with breath held and hearts pounding, cheering, and cheering and cheering. Nicky, your family is so proud of you! Thanks very much for this great post. For us, LL and the Temple's will always be inseparable. How many hundreds of hours have we spent bored or agonizing in the stands over the past 6-7 years? Who will fill the void left when you are no longer there to scream your support and occasional frustration? Will be sad next year to not have you there, but you can be sure that we will have an honorary spot in the bleachers and a red solo cup waiting. Thank you so much for reading. I hope you enjoyed it. I thought it was in some ways a documentary about ours sons growing up. This was an emotional piece to write and then your comments left me quite choked up! Love you guys! !